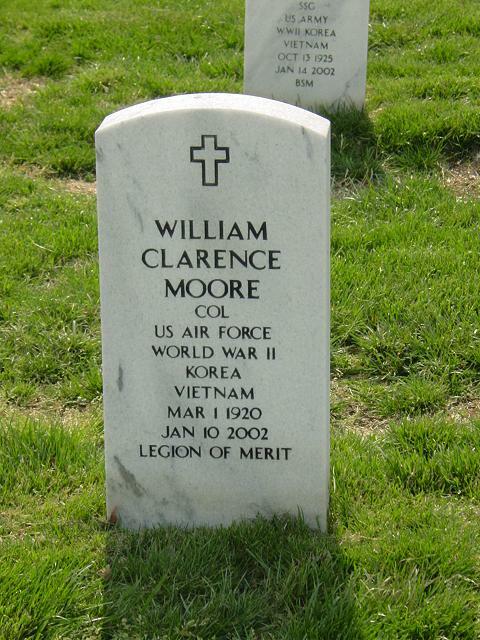 Colonel William Clarence (Bill) Moore, U.S. Air Force (Ret.) of Austin Texas, was born March 1, 1920 at Fort McHenry, Maryland, the son of Emma McNeil Moore and Henry Hayes Moore, passed away peacefully at home on January 10, 2002. Sharon Byron of Austin, William C. Moore, Jr., and Roxann Horton of Austin, Bruce Moore of Austin and granddaughter, Michelle Byron Alldredge of Austin. Bill graduated June 1943 from the United States Military Academy at West Point, New York and lived his life forever true to its motto - Duty, Honor, Country. the Asiatic Pacific Campaign of Japan, the Philippines and Hawaii. He commanded a Bomb Squadron as a B-24 pilot in the Liberation of the Philippines. He served as Commander, Airlift Squadron in the Berlin Airlift. His focus on war strategy and planning began in 1952 when he was assigned as a War Planner for the Joint Chiefs of Staff, Strategic Plans Group. His command as a War Planner branched to the Joint Chiefs of Staff at the Pentagon; Commander-in-Chief Pacific Command in Honolulu, Hawaii; and Supreme Headquarters, Allied Powers Group Europe (SHAPE) in Paris, France. He participated in many high level projects including the "Agonizing Reappraisal" when the Economic Defense Community failed; the Geneva Conference of 1955; the initial "Operations Alert" in 1955; and the Austrian Peace Treaty. He was the CINCPAC operations representative to the U.S. Technical Mission to Australia; he helped formulate the Joint Chiefs of Staff Unified Command Plan and served on a antional security committee reporting directly to President Eisenhower. He graduated from the National War College in 1961. Colonel Moore served as Vice Commander, Headquarters Command at Bolling Air Force Base in Washington, DC until 1972 when he retired from military life. Longevity Service Award with 6 Oak Leaf Clusters. for numerous periodicals including U.S. News and World Report, The New York Times, and The Washington Post. He and Marion headed to Texas to live their retirement years close to family and play golf. Bill owned The Tool Box until it was sold in 1995. His family will remember him as a compassionate father and grandfather whose strong character, wisdom and loving hand influenced us all and will continue to touch our lives. Interment for Bill and Marion will be in Arlington National Cemetery in Arlington, Virginia on Tuesday, February 19, 2002 at 1 p.m.